... but the next best thing is a good reference book. 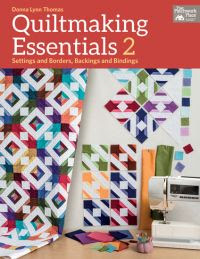 Quiltmaking Essentials 2 by Donna Lynn Thomas covers not only borders but also backings, bindings, sashings, and quilt block settings with lots of diagrams and photographs of quilts illustrating the different options. It is a wonderful resource for your library, particularly for those times when you make beautiful blocks but have no idea where to go from there. Or, let's say you like the blocks of a quilt pattern but wish you could set them another way (am I the only one? ): Donna shows you options and guides you with detailed and easy-to-understand instructions. You will also learn how to calculate border width, how to sew on-point quilts, unequal size block settings, how to bind scalloped borders... You get the idea!